Legend of Zelda : Skyward Sword In The Legend of Zelda Skyward Sword, Link is about 17 years old. He is a young student attending the knight academy at Skyloft at the beginning of the game and matures throughout his search for Princes Zelda. Link�s sculpt accurately represents his character from The Legend of Zelda Skyward Sword. 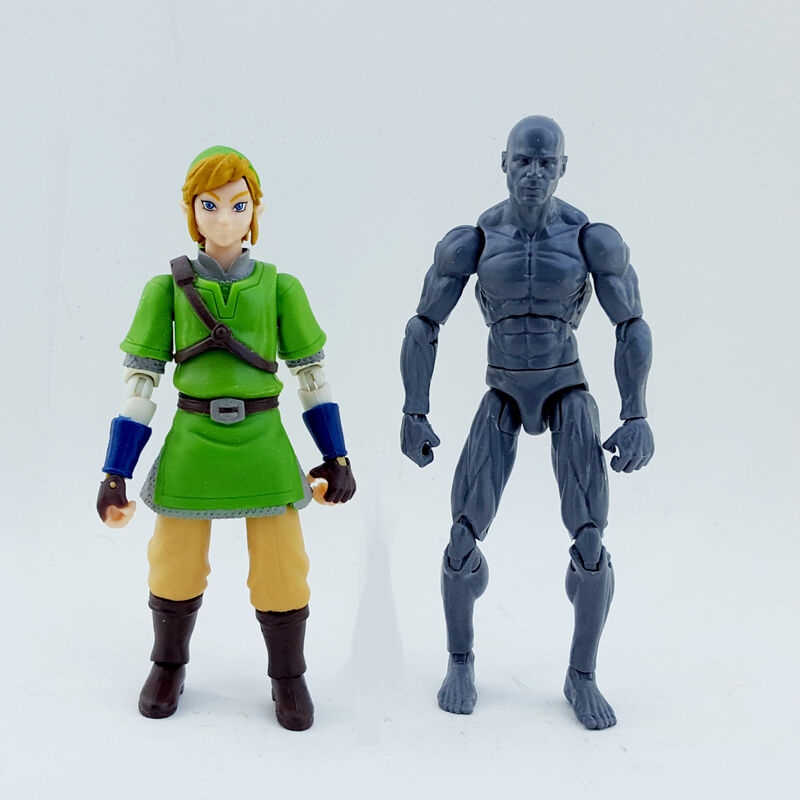 Most of the sculpt uses very clean lines to give Link an animated look. The designers incorporated the joints into the figure so that most of them are very well hidden. One thing that they are missing is peg holes on the bottom of his feet. Articulation: Skyward Sword Link has an impressive array of very useful articulation and was very surprising due to the limited information leading up to his release. His tunic does restrict some of his ability to spread his legs out to their full potential but that is easily remedied by making a small cut further up the side of his tunic. Neck ball Hinge/swivel shoulders Dual swivel/hinge elbows Hinge/swivel wrists Mid-torso swivel Hinge/swivel hips Hinge/swivel knees (note the swivel action is on the bottom of the knee to hide the joint) Barbell ankles � This type of articulation for ankles has to be one of the best I have seen to give the figure the ability to stand very well. Paint: All of the colors are crisp and bright as he is portrayed in Skyward Sword. Jakks didn�t use too much paint for the figure and instead cast most of the pieces in the color they wanted. 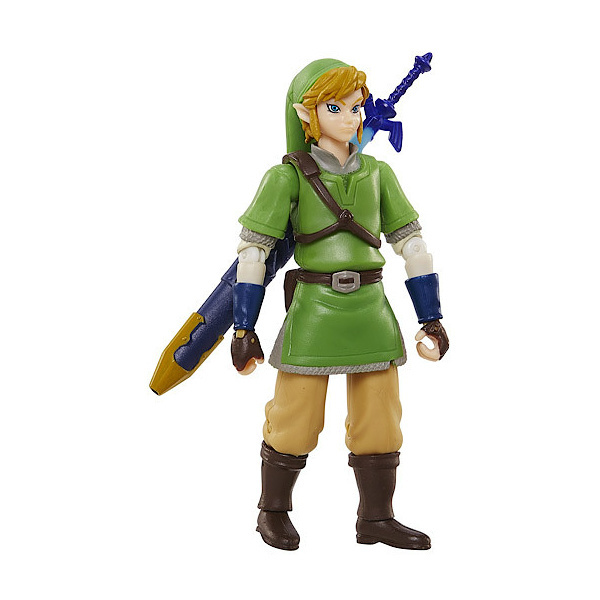 Link�s tunic and hat are cast in a woodland green to represent his most iconic outfit and with tan plastic pants and a darker brown for the boots. The places that were painted have good lines and don�t bleed into other areas, with the exception of the chainmail seen under his tunic. The subject of my review seems to have vest small amounts of grey there and the green underneath is clearly visible. His eyes are particularly well done and give the �Anime� look just like he had in the game. Accessories: Link comes with the Master Sword and a sheath that fits into a plug on his back. He also has a �Mystery Box� with a special treasure inside. **Spoiler Alert** Link�s metal shield with the Hylan crest is the secret treasure.